Researchers at Ohio State University have discovered how to magnify a quantum mechanical effect that converts heat into a special kind of electrical current. 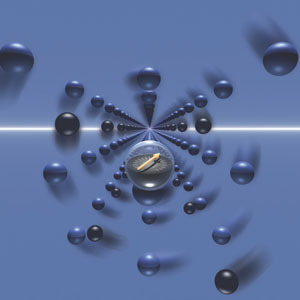 In this artist’s rendering, a polarized electron (center) travels through a semiconductor crystal inside a magnetic field. The spheres surrounding the electron are atoms within the crystal. Heat particles called phonons (not shown) have propelled the electron forward, sending it spiraling through the material like a bullet through a gun barrel. The result is a voltage that is a thousand times bigger than previously observed from this effect. Image by Scott Dennison, courtesy of Joseph Heremans and Roberto Myers, Ohio State University. Published in the journal Nature, a new study describes how scientists at Ohio State University created the “giant spin-Seebeck” effect, converting heat to electricity in a non-magnetic semiconductor. Columbus, Ohio – Researchers who are studying a new magnetic effect that converts heat to electricity have discovered how to amplify it a thousand times over – a first step in making the technology more practical. The resulting voltages are admittedly tiny, but in this week’s issue of the journal Nature, the researchers report boosting the amount of voltage produced per degree of temperature change inside the semiconductor from a few microvolts to a few millivolts – a 1,000-fold increase in voltage, producing a 1-million-fold increase in power. Great progress has been made in understanding how the spin-Seebeck effect works, but many details are still a mystery. Though researchers around the world have been able to reproduce the spin-Seebeck effect with some success since it was discovered at Tohoku University in 2008, a unified theory is lacking. And the same holds true for the giant spin-Seebeck effect, though the Ohio State researchers have several suggestions as to what’s going on. The researchers think that they were able to induce a powerful stream of phonons inside the semiconductor. The phonons then smashed into the electrons and knocked them forward, while the atoms in the semiconductor made the electrons spin as they streamed through the material – like a bullet spinning in a rifle barrel. Still, when they heated one side of the material one degree, they detected a voltage of 8 millivolts (thousandths of a volt) on the other side. That’s three orders of magnitude bigger than the 5 microvolts (millionths of a volt) ever produced by researchers using the standard spin-Seebeck effect. Heremans and his team are exploring other materials – magnetic and otherwise – to push the effect further. This research was funded by the National Science Foundation and the U.S. Department of Energy. 2 Comments on "Converting Heat to Electricity in a Non-Magnetic Semiconductor"
Phonons? Heat is actually infrared radiation, therefore infrared photons. No need for “phonons”. Also, I wonder if this would work with a superconductor?